Moscow's suggestions that civilians were poisoned by rebel weapons on the ground have been widely rejected. The UK's foreign secretary, a rebel commander and a weapons expert all said evidence pointed to an attack by the Syrian government, Russia's ally. International donors have pledged $6bn (£4.8bn) in aid for Syria this year. Seventy donor nations discussed aid efforts in the war-ravaged country in the Belgian capital, Brussels. Could there be "no-fly" zones at last? 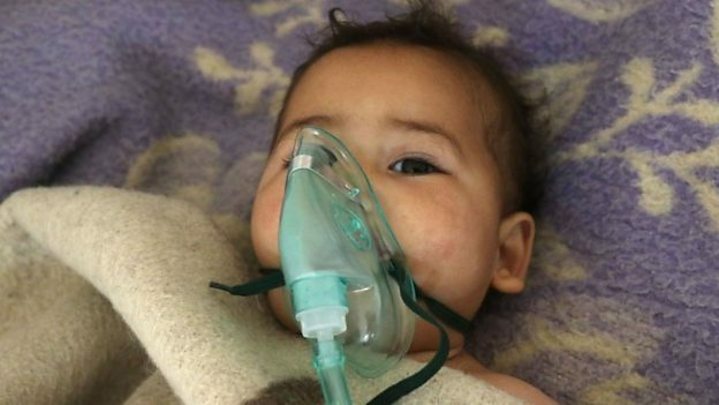 According to UK-based monitoring group the Syrian Observatory for Human Rights, 20 children and 52 adults were killed in the chemical incident in Khan Sheikhoun, Idlib province, on Tuesday. Footage following the incident shows civilians, many of them children, choking and foaming at the mouth. Some of the victims were treated across the border in Turkey. One woman in hospital said: "We were affected by the gas. We couldn't stand up. I felt dizzy and sick. I suffer from shortness of breath. I couldn't breathe." The World Health Organization said some of the victims had symptoms consistent with exposure to nerve agents. 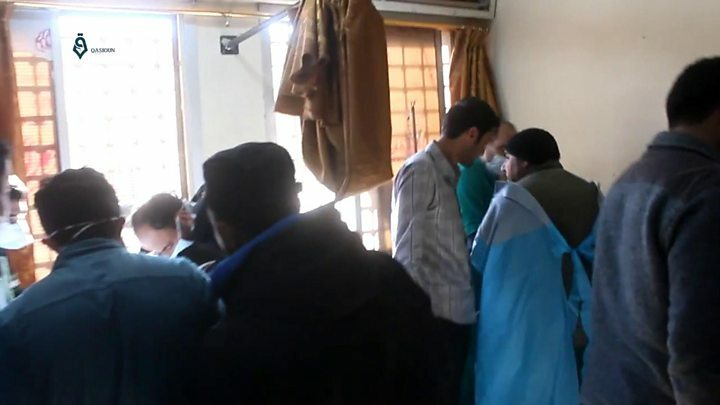 A team from medical charity MSF treating victims in Idlib found patients' symptoms were "consistent with exposure to a neurotoxic agent such as sarin gas", the charity said in a statement. Sonia Khush, Syria director of the charity Save the Children, said victims had travelled far and wide to get treatment, making it difficult to estimate how many had been affected. The government of Syrian President Bashar al-Assad denies its forces launched a chemical weapons attack. Russia has acknowledged that Syrian planes did attack Khan Sheikhoun but says the aircraft struck a depot producing chemical weapons, for use by militants in Iraq. "Yesterday [Tuesday], from 11:30am to 12:30pm local time, Syrian aviation made a strike on a large terrorist ammunition depot and a concentration of military hardware in the eastern outskirts of Khan Sheikhoun town," Russian defence ministry spokesman Igor Konoshenkov said. What did they say at the UN? Matthew Rycroft, the UK's ambassador to the UN, told the Security Council that Mr Assad had "humiliated" Russia by "making a mockery" of the peace process it had brokered with some rebel groups. "What is your plan?" he asked. "What is your plan to stop these horrific senseless attacks? We had a plan and we had the support and you rejected it to protect Assad." Russia and China have blocked attempts to impose sanctions on Syria. Russia's deputy ambassador to the UN, Vladimir Safronkov, hit back by accusing the UK of being "obsessed" with overthrowing President Assad instead of seeking peace. He said his country - which can veto any UN Security Council resolution - saw no need for a new resolution and called for a "full, objective" international investigation. Much of the video evidence of the attack had, he argued, been "staged". The US ambassador to the UN, Nikki Haley, said Syrian chemical attacks would continue if nothing was done. "Time and time again Russia uses the same false narrative to deflect attention from their ally in Damascus," she said. Hinting at possible unilateral action by the US, she added: "When the United Nations consistently fails in its duty to act collectively, there are times in the life of states that we are compelled to take our own action." French UN envoy Francois Delattre blamed the Assad government for the attack, accusing it of "destructive madness". He said the world needed an "America that is seriously committed to a solution in Syria". What do others say to the Russian version? Is Trump partly to blame? A chemical weapons expert, Col Hamish de Bretton-Gordon, told the BBC that the Russian version of events was "pretty fanciful". 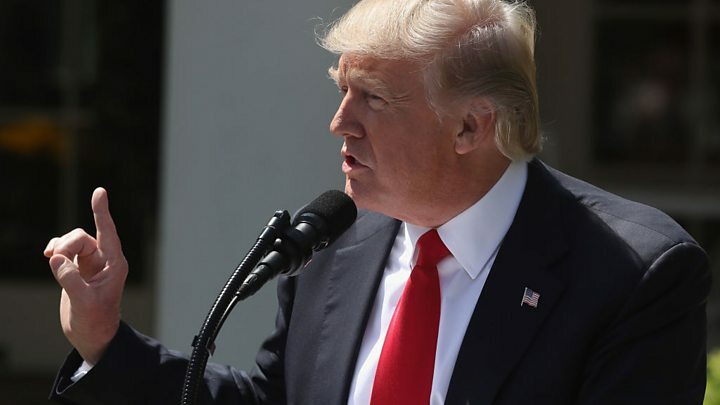 US President Donald Trump called the deaths a "terrible affront to humanity". Has Assad used chemical weapons before? The Syrian government was accused by Western powers of firing rockets filled with Sarin at Ghouta. President Assad denied the charge, blaming rebel fighters, but he did subsequently agree to destroy Syria's chemical arsenal. Despite that, the Organisation for the Prohibition of Chemical Weapons has continued to document the use of toxic chemicals in attacks in Syria. How bloody is Syria's civil war? More than 250,000 people have been killed and, after more than six years, no political solution to the fighting is in sight. "This is the most complex and the most violent conflict in our times," EU foreign policy chief Federica Mogherini said at the conference in Brussels.